Kirk Bell June 10, 2016 Comment Now! Fifty years ago, Fiat sought the help of the legendary Pininfarina design firm to turn its somewhat stodgy 124 sedan into a stylish convertible sports car. The result was a simple but attractive drop-top that would enjoy a 19-year production run of more than 200,000 cars—roughly 170,000 of which were sold in the United States. Pininfarina not only designed the car, but also built most of them, and it never needed to redesign the car's classic sports car shape. Fiat left the U.S. in 1983, and returned in 2011 with the 500 city car. Sales haven't gone gangbusters since their return, and now Fiat is expanding its line with a new 124. Once again, Fiat sought help from elsewhere to design and build this car. This time, however, Fiat didn't look to Italy. Instead it turned to Japan. 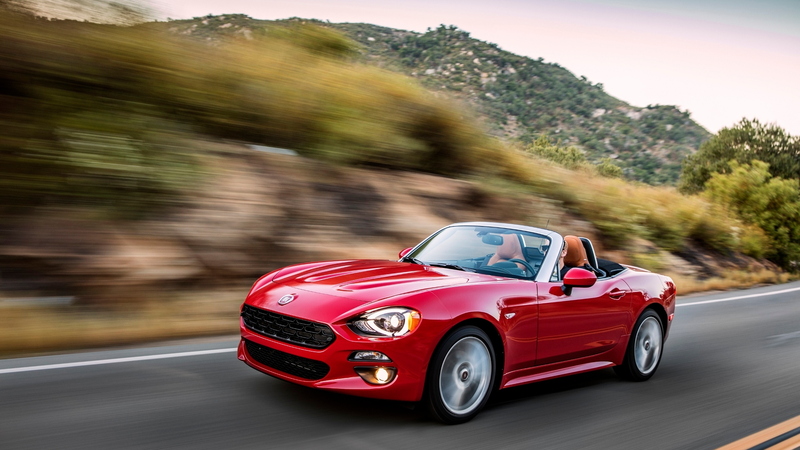 The 2017 Fiat 124 Spider shares its architecture with the fourth-generation Mazda MX-5 Miata. Both cars ride on the same 90.9-inch wheelbase, use the same front wishbone and multi-link rear suspension setups, and even share the same Mazda-based infotainment system. The looks are completely different, however, and so are the engines. Is turbo the way to go? While Mazda uses its naturally aspirated 2.0-liter 4-cylinder that makes 155 horsepower and 148 pound-feet of torque, the Fiat is motivated by Fiat-Chrysler's single-overhead cam, turbocharged 1.4-liter 4-cylinder. The 1.4-liter's power figures—160 hp and 184 lb-ft of torque—best the Miata's, but that doesn't translate into the real world. A hint of turbo lag and the weak low-end power of a small-displacement engine mean the 124 takes 6.8 seconds to run up to 60 mph. That's pretty quick, but the Miata, with its more immediate punch, needs only six seconds flat. The issue can be mitigated slightly by revving the engine in the sweet-shifting manual models; the automatic just makes the power gap more prominent. The transmission shift paddles in the Abarth also help a bit, but I found power to be a bit sludgy in an automatic-equipped Lusso model, which is heavier because of its extra equipment and it lacks the shift paddles. Despite its smaller size, the 1.4-liter isn't quite as efficient as Mazda's engine. It is rated at 25 mpg city, 36 highway, 29 combined with the automatic transmission and 26/35/30 mpg with the manual, while both versions of the Miata get 30 mpg combined. Based on power delivery and fuel economy, the turbo isn't ideal here, and Mazda has the better solution. The addition of direct injection might change that, as it would add power, improve fuel economy, and reduce some of that turbo lag. Your move, Fiat. 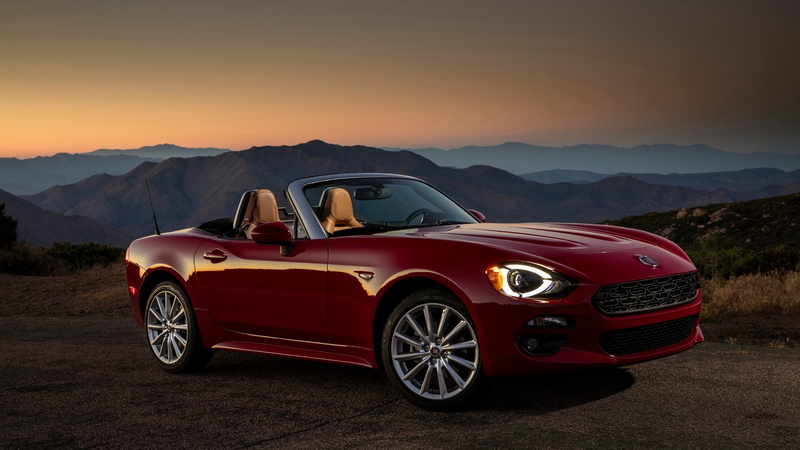 The 2017 Fiat 124 weighs in at a featherweight 2,436 pounds in its base form. That's very light, but it's 104 pounds heavier than the Miata. Not too worry, though. The car delivers the same kind of smile-inducing ride and handling character as its Japanese counterpart. For those who haven't driven the Miata, that means the 124's steering is light and direct, the ride is as smooth as you would expect from a family sedan, and there is notable body lean in corners. However, when driven hard, the suspension compresses and the car rotates through turns steadily, predictably, and with a lot of feedback as it approaches the limits of traction. Its most impressive trait is its ability to shift its weight from side to side, immediately take a set, and head off in the opposite direction. Few cars can jitterbug from one direction to the next as willingly. Fiat provided an opportunity to drive the sportier Abarth models on an autocross course during its San Diego-area test drive. The Abarth gets four extra horsepower due to a unique exhaust. It also has Bilstein shocks, Brembo brakes, and a limited-slip differential, just like the Miata Club model. The autocross course showed just how predictable the 124's handle really is. Toss it from side to side, apply the brakes to help it rotate or stab the throttle to induce a bit of oversteer, and the 124 responds to your every command. It's easy to drive fast without getting in trouble. As an interesting counterpoint, Fiat had a 124 modified with Mopar parts to drive as well. Outfitted with a strut tower brace, a lower arm bar, and a pair of vertically aligned tunnel braces, the 124's stiffer structure made it harder, but arguably more fun, to handle. The rear end was much more willing to step out, making it easier to steer with the throttle, but harder to keep from spinning. It just goes to show how well those Japanese, Italian, and American engineers tuned this car to be balanced, fun, and predictable. Put simply, the 124 in its stock form is a driver's car, and the Mopar parts are for those with some performance driving experience under their belts. 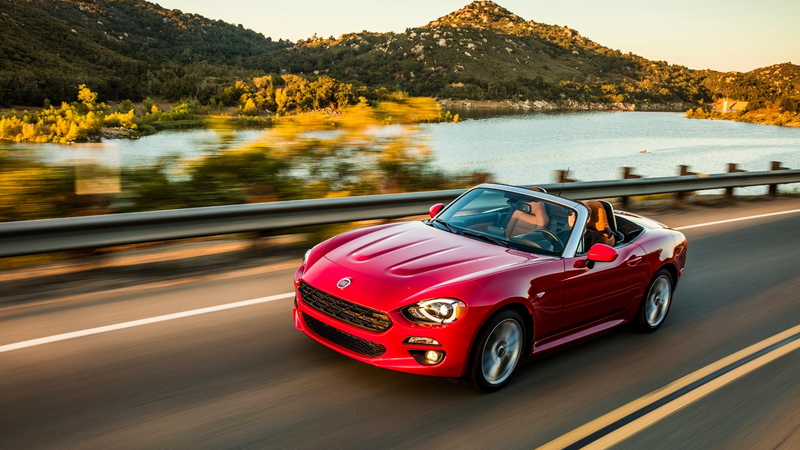 Inside, the Fiat is a step up from the Miata. Working with the same space and essentially the same overall design as Mazda, Fiat saw fit to spruce up the cabin with higher quality materials that resulted in a bit more flair. Magnifico! Where the Miata uses hard plastics for the dash and the door tops, the 124 has soft-touch materials. The shift knobs have a more involved design, and the hood of the instrument panel is wrapped instead of bare. Fiat also made more effort to block noise, adding an acoustic windshield, a dash panel insulator, polyurethane-backed carpeting, glass-wool tunnel insulation, trunk area and rear floor insulation treatments, a rear wheelhouse mudguard, and a thicker rear window. With the top up, it's still somewhat noisy, and rear tire noise is especially noticeable, but it's a calmer environment than the Miata's. The rest of the interior is taken almost entirely from the Miata. The seats employ the same netting and urethane structure instead of springs. We find them comfortable for a few hours at a time, but they may not offer long-trip comfort. Interior storage is light, the same movable cupholder stalks are used, and the cloth top is easy to operate with one arm. 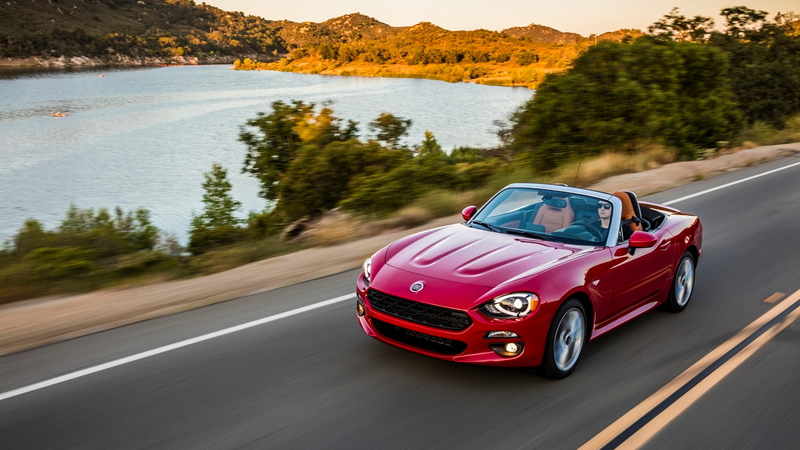 Fiat will tell you that it has done enough work to the 124 that it is not a version of the Miata. Instead, the 124 should embrace its inner MX-5. Mazda has been making its delightful roadster for a quarter century and the latest model is the best yet. The 124 is a tad slower than the Miata, has its own style inside and out, and offers a more premium interior environment, but the same basic fun-to-drive character carries over from Japan to Italy. 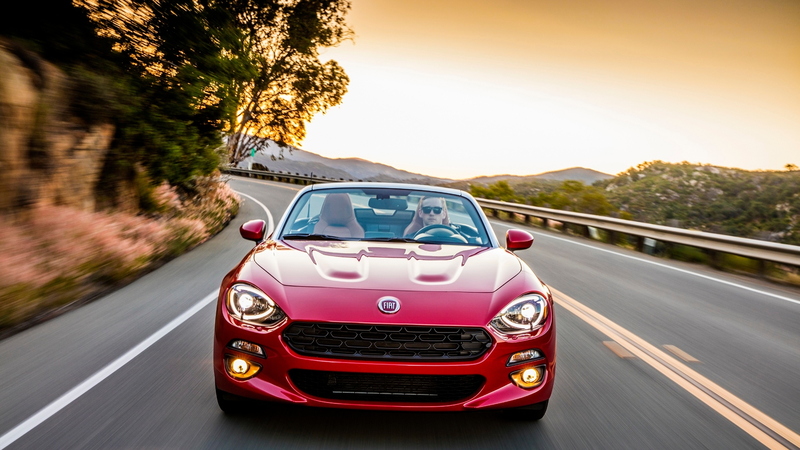 Seems to me Fiat is pretty darn good at choosing partners to build its sports cars. These driving impressions are from an invitation-only automaker launch event that allowed special access to the vehicle and executives. Fiat covered our overnight accommodations, meals, and transportation costs. Follow Motor Authority on Facebook, Twitter and YouTube.